Mayor Antonio Villaraigosa flipped the switch recently, on the final traffic intersection in the citywide signal synchronization program. All of Los Angeles’ 4,398 traffic signals are now part of the Automated Traffic Surveillance & Control (ATSAC) system. The completion of this program decreases average travel time for commuters throughout Los Angeles and improves air quality by reducing greenhouse gas emissions. The signal synchronization program originated in advance of the 1984 Olympics, but was left in limbo until 2005 when Villaraigosa vowed to finish the project. 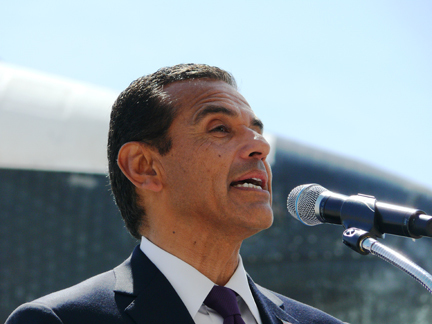 After campaigning heavily for Proposition 1B, Villaraigosa ensured that $150 million was allocated to help accelerate the citywide traffic control system. "As a result of signal synchronization, our system increases travel speed by 16% and reduces travel time by 12%," said Jaime de la Vega, general manager of the Los Angeles Department of Transportation (LADOT), citing LADOT’s studies of traffic before and after implementation. Independent analysis reached similar results. "Finding solutions to reduce congestion is one of my top priorities as chair of the Transportation Committee," Councilmember Bill Rosendahl said. "The signal synchronization project will improve rush hour traffic flow and help people get to their destinations quicker. I want to extend my sincere appreciation to the Los Angeles Department of Transportation and the traffic engineers who are currently working to resolve the timing issue at Pacific Coast Highway and Sunset Boulevard. I'm looking forward to the moment when things are resolved in the Palisades, and I'm excited for all Angelenos to experience the benefits of this project, whether they're traveling by car, bike, or on foot." In addition to easing traffic, the intricate network can be utilized by law enforcement and emergency response vehicles, or for unusual signal timing for major special events at venues like the Coliseum, Dodger Stadium, and Staples Center/LA Live.